As March comes to a close, the first ever Open Infrastructure Summit is only a few weeks away – and as one of the proud sponsors, we couldn’t be more excited! This opensource event is being organized by the OpenStack Foundation and takes place from April 29th through to May 1st at the Denver Convention Center in Denver, Colorado. During the market place hours, you can find the VEXXHOST team at booth B2. We’ll be giving away a total of $40,000 in credits towards our public cloud throughout the 3 day event, so don’t forget to pass by and claim your $200 credit! You’ll also find us there serving up a variety of sandwiches and Vietnamese meatball skewers at the marketplace mixer on Monday night, so we hope you bring your appetite! OpenStack Ansible Project Update – Monday, April 29th, 11:35 – 11:55 AM. OpenStack Ansible Project Onboarding – Monday, April 29th, 2:50 – 3:30 PM. Deployment Tools: Define Common Capabilities – Tuesday, April 30th, 9:50 – 10:30 AM. Kubernetes Bedtime Stories: Taking the “Scary” out of Production Workloads – Wednesday, May 1st, 3:20 – 4:00 PM. You may be able to spot the VEXXHOST team at the official attendee’s party or giving a quick presentation at the demo theatre as well! If you’re looking for a good breakfast or brunch spot, you can’t go wrong with Snooze on Larimer street or the Denver Biscuit Company on East Colfax Avenue. For dinners, Hops and Pie caters to craft beer lovers with their pizzas, smoked meat and extensive beer listing, and, for those who are more wine-inclined, Cru is a great wine bar option! The Denver Botanic Gardens, located off of York Street, is open from 9-5 every day and offers 24 acres of gardens and diverse plant varieties. The renovated Denver Union Station has become not only a must-see landmark but also boasts some award-winning restaurants and retail stores. It’s located off of Wynkoop street, making it a short drive from the Denver Convention Center. The Denver Art Museum, also near the Convention Center, is known to have the only major Asian art collection in the Rocky Mountain area. 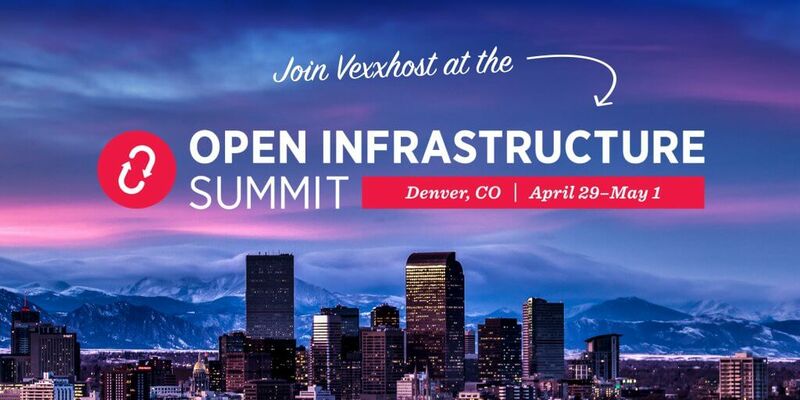 The VEXXHOST team can’t wait for OpenStack’s first Open Infrastructure Summit and we hope you’ll be joining us on April 29th for this awesome event in Denver! Remember, it’s not too late to grab your tickets, all you have to do is click this link and follow the instructions.